Product #3831 | SKU Z-ERM | 0.0 (no ratings yet) Thanks for your rating! 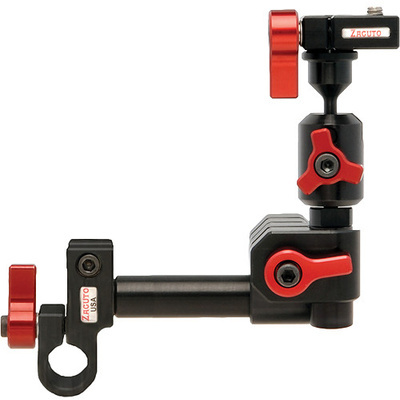 The Zacuto EVF Rod Mount attaches your Zacuto EVF to any 15mm rod. This is perfect if you want to connect your EVF Mount to another manufacturer’s rig or to a Zacuto Universal Baseplate when using a video camera such as the AF-100, Sony F3, or FS100. The combination of our Z-mount Zwivel 360 degree connector at the corner and our tilt and pan mount at the top give you unlimited options for placing your EVF. The Zicro Mini allows you to quickly release your EVF from the EVF Rod mount with a flip of the lever. The horizontal and vertical rod ends are threaded female so rod extensions can be used for both distance and height. This truly is a versatile mount enabling the user to place their EVF exactly where it needs to be.